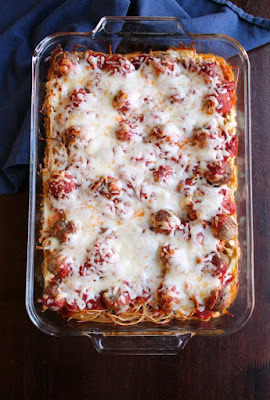 Baked spaghetti and meatball casserole is a fun twist on that classic favorite dinner. It is easier to make than lasagna and more fun too! On top of spaghetti, all covered with cheese. I lost my poor meatball, when somebody sneezed.... Of course spaghetti and meatballs is one of those foods that makes you feel like a kid again. There is something so fun about long noodles covered in sauce and cheese. Plus there is a satisfaction that comes with taking a bite out of a meatball. But I'll let you in on a little secret. (Shhhhh!) As a parent to a toddler, spaghetti and meatballs are not quite as much fun. Don't get me wrong, it is fun to watch the little guy enjoy himself with a big plate of 'sketti. But as he's slurping the noodles, it is hard not to notice the specks of sauce flying. Then there's the meatballs. The glorious meatballs. They are unlikely to actually go rolling away because of a sneeze, but the chances of one hitting the floor don't seem so astronomical. Add to that the fact that we have light colored carpet on our dining room floor. Don't ever put light colored carpets on a dining room floor! It was there when we moved in, but we didn't have a little one yet so we didn't think much of it. We always had a drop cloth under his highchair, so it still wasn't a huge deal when he was younger either. But now he is a big boy and eats at the big table. Really, he does a pretty good job for the most part. There are likely to be almost as many splatters and crumbs around my husband's spot as Little Dude's. BUUUT, it still makes me nervous. We keep saying we are going to replace the carpet, but it seems a shame to rip it up when it's in pretty good shape. Plus there's the whole contractor's wife thing. Actually Matt is pretty good about stopping to do a project at the house when I ask him to. I just need to tell him what the project is, pick out the materials and design and then we sync our calendars to find a block of time that will work. We both mark it in and it gets done. But it is really hard to ask him to block of time where he could be doing paying jobs to replace flooring that isn't bad. So one of these days a glass of red wine.... or a meatball will end up on the floor. In the meantime we just try our best not to let that happen! All of that was the long way of saying I wanted to recreate spaghetti and meatballs so that there wouldn't be as much slurping. And with any luck there wouldn't be any meatball covered in tomato sauce hitting the floor. So, I made spaghetti and meatballs in casserole form. It's easier to serve and fun to eat. Plus there is just something about baked pasta (and all of the accompanying cheese!) that makes it that much better. It's a new twist on one of my childhood favorites and is sure to be one of Jax's childhood favorites! What are you favorite foods from childhood? I originally wrote this post in July of 2016. I made it again the other night and thought I would snap a few updated pictures to share with you. I originally made this recipe with ricotta cheese, but have since made it with cottage cheese quite a few times too. Both work great, so use whatever you have on hand or whichever you prefer in lasagna. If you are a fan of spaghetti and meatballs, you may want to try creamy spaghetti and meatballs in the instant pot too. It is a quick and easy way to whip up dinner! Isn't baked pasta and all if it's melty and browned cheese the best? 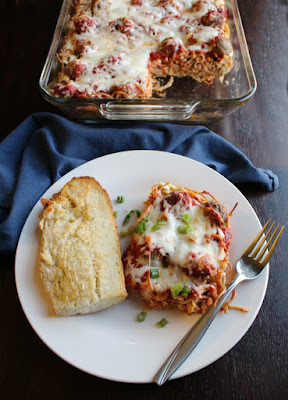 This is a fun twist on a family favorite dinner! Make your meatball recipe into small, bite sized meatballs and bake according to your recipe. Set aside until ready to use. Cook your spaghetti to al dente. Drain and set aside to cool slightly. 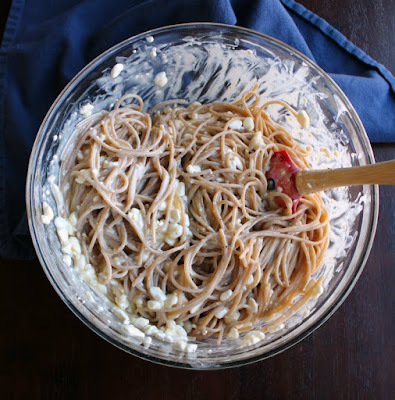 Once your spaghetti is cool enough to handle, stir together the ricotta, garlic, eggs and a pinch each of salt and pepper. Toss the noodles in this mixture and press into a well greased 9x13" pan. Place meatballs on top of spaghetti and distribute sauce over the casserole. Remove cover and sprinkle with mozzarella cheese. Return to oven for 10-15 minutes or until cheese is melted and browned to your liking. Allow to sit for 10 minutes, then cut and serve. My family would love this!! Adding gooey mozzarella to the usual spaghetti and meatballs can only make it better! Gooey mozzarella makes most things better! I think that is why I love baked pastas so much. Thanks, Liz! 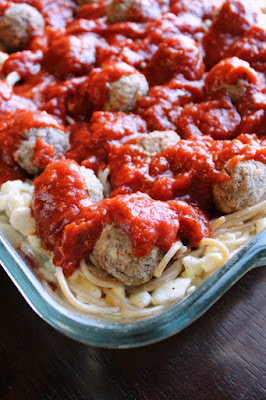 This is such a creative way to change up the usual pasta and meatballs! I can't wait to try it. It was a hit at our house! Any time you can add two extra cheeses to a dish, it is sure to get thumbs up from my boys. Thanks, Tammi! I can see this being such a comforting treat! It is, hearty and delicious! Thanks, Caroline! This is 100% a win for me! 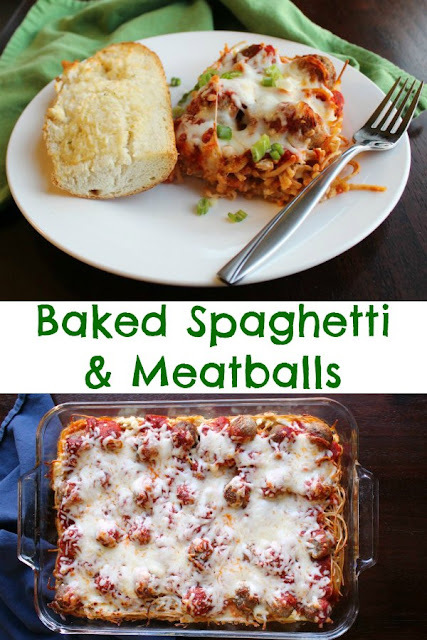 What a great way to enjoy spaghetti and meatballs! This looks delicious and will be a huge hit in my house this winter! Always looking for way to change up spaghetti and meatballs too. Thank you! It is a fun way to make a classic new again! Who could resist some of this comfort food goodness?? Looks like a delicious recipe that any family...including mine would love! Delish! Thanks, Erin! It is definitely a family friendly dinner and a great make-ahead too! Oh. My. Gosh. Yes! We're renting the place we're in now and it has light carpet. EVERYWHERE. (Except bathrooms and kitchen of course) We have two little ones. I keep towels down under their chairs. Once all those college move in sales happen I'll be looking to invest in an area rug or two. I like your casserole form of spaghetti and meatballs. It's perfect for serving to a crowd, too. It's the worst isn't it? When we moved in, I didn't think much about it because I was pregnant. Now with a toddler I am acutely aware of the carpet! We just bought some canvas drop cloths from the hardware store and used them for the longest time. They were cheap and machine washable. Now that he's at the big table we take our chances and hope for the best! What a great casserole! I love the "squares ". Makes it easy to serve! It is a lot easier to serve too, you're right! Thank you! Spaghetti and meatballs is one of my childhood favorites. I can understand why Jax's absolutely loves it. It's a lot of fun to eat and play with. Especially when you know that Mom's a little apprehensive about the carpet! My mom used to make a baked spaghetti for us and we loved it. It was actually a baked spaghetti Pizza. It had spaghetti noodles and sauce and beef on the bottom and then it was topped off with pepperoni, pizza sauce and mozzarella. I make it for our family too and it is one of our favorites. It has such a different texture when it's baked, doesn't it? Especially when the cheese is nice and toasty on top. Yum. Oh my goodness, how fun! I love the pizza idea. I may have to steal that one! There just is something about baked pasta that takes it to the next level, the melty cheese certainly doesn't hurt. This is a dish that my grandson would just love to eat every day. Thanks so much for sharing your recipe with us at Funtastic Friday. Thanks, Sherry! It is a fun one, that is for sure. I hope you both enjoy it! Thank you!! I hope you love it! 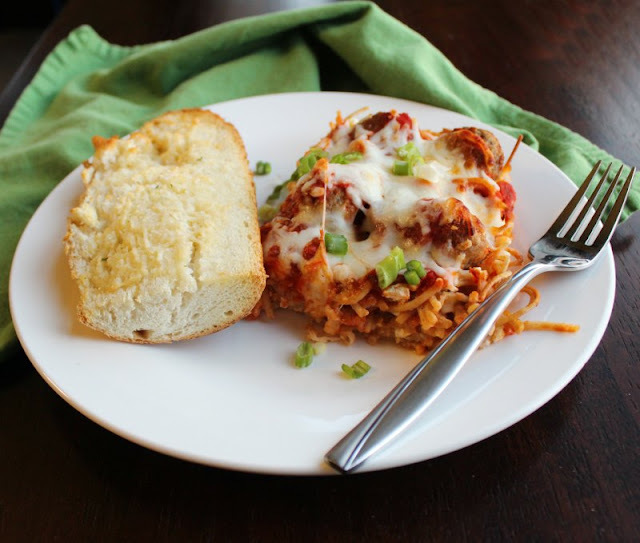 What a great casserole for Sunday Supper, we would really enjoy this recipe. Thanks so much for sharing with Full Plate Thursday today. Have a great day and come back soon! It's a nice hearty family meal. Thanks, Miz Helen! Goodness, you have me going down memory lane with "on top of spaghetti"! Right back to my grandmothers house! And that has me remembering her best baked chicken dish. Have to see if I can remember how she did that. This dish looks great! Meatballs are the best way to enjoy spaghetti! Isn't it funny how a line of a song like that can bring you right back to childhood? Now I want to know what was in her chicken dish! Thanks! What do you think about adding mushrooms, cut-up spicy sausage links, and zucchini with the meatballs on top? That's how I like my traditional spaghetti, so it might work in this baked variation? That sounds delicious! I will have to make it that way next time! So I'm wondering if the carpet is still surviving. The spaghetti and meatball casserole sounds fabulous. What a great idea! It is still hanging in there, surprisingly enough! Thanks! You just can't beat spaghetti and meatballs. This looks perfect, Carlee! This is a fun way to switch up the favorite! Thank you! This sounds so good Carlee! Who wouldn't love this casserole?! I haven't met anyone yet! Thanks, Kitty! This is awesome! I am so happy to find recipes that my little grand daughter will eat, she is so picky. Thank you for sharing. She's going to love it! Thank you! Question! Do you cook freshly made meatballs before putting into casserole?! You certainly can! I just used frozen meatballs to make it quick and easy!